You’ve most likely seen horrific images of mange-ridden dogs being rescued by animal organizations. What you may not know is that mange doesn’t just affect neglected animals. This common skin disease can strike any pet. Untreated mange can result in a hairless, sore-covered dog in lots of pain. That’s why it’s important to treat mange at first sight. Don’t let your dog’s skin turn to stone. 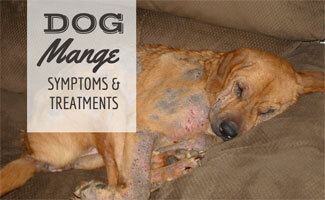 Mange is a skin disease that’s caused by a particularly prolific parasite called a mange mite. 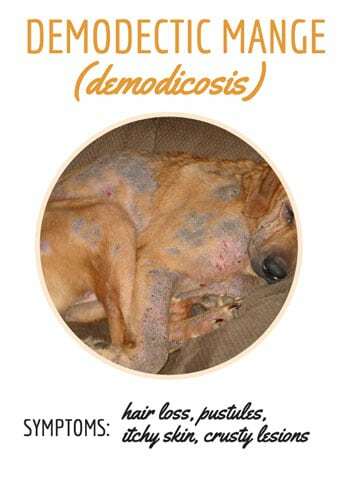 There are two types of commonly diagnosed mange, demodex and sarcoptic. Demodectic mange, also known as demodicosis or demodex, is caused by a commonly occurring mite called Demodex canis. This mite normally inhabits every dog’s skin, but problems occur when these mites overpopulate due to the dog’s immune system being unable to keep the mites under control. 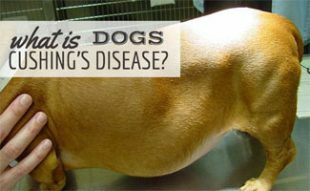 Dogs suffering from demodectic mange either have localized areas of the disease, or their entire body becomes infected. The good news with this form of mange? Demodectic mange is not contagious. If you suspect that your dog has mange, your vet will take skin scrapings to diagnose demodectic mange. For generalized cases, a dog might need long-term medication. Sarcoptic mange, or scabies, is caused by Sarcoptes scabiei (a type of parasitic mite). Scabies is extremely contagious between dogs and can also spread to humans and other animals. It often begins in one area of the body and if left untreated, can cover the entire body. Symptoms usually appear anywhere from 2 to 6 weeks after exposure. High exposure locations include kennels, vet clinics, groomers, dog parks and shelters. 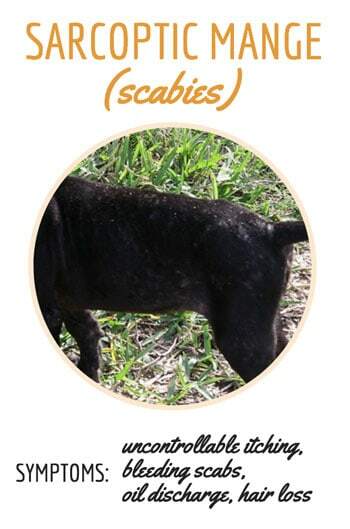 Your vet will take a skin scraping to diagnose scabies; however, there are many false negative results with scabies. Often this diagnosis is made by exclusion or a therapeutic trial of medication. 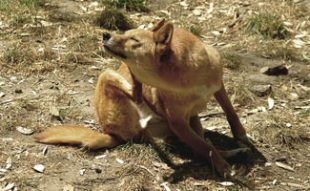 Owners often complain of itchiness after a vet diagnoses their dog with scabies. Remember, you can catch scabies from your dog! Much like demodectic mange, the treatment for canine scabies is typically very successful and carries a good prognosis. A licensed veterinarian should oversee treatment, which often involves prescribing a drug that kills the mite. In some cases, you can use a scabicidal shampoo to kill the mites living in your dog’s skin. Ongoing treatment will be necessary since eggs take time to hatch. If you think your dog has mange, schedule an appointment with your vet to get an official diagnosis. The last thing you want is to assume that your dog has one illness when really, it’s something else. Slice 1 lemon (keep the peel on) and add it to boiling water. Let it sit overnight and apply the mixture to your dog’s coat using a sponge. Depending on the severity of mange, your vet may advise you to skip a home remedy and instead recommend a prescription or other course of treatment. 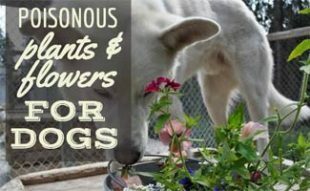 If your dog has demodectic mange, you may be interested in this article about essential oils for dogs. 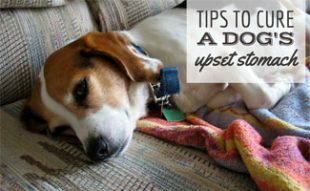 It also includes other ways you can treat common ailments for dogs like fleas, allergies, anxiety and more. Read this if you wish to gain a better understanding of other common skin conditions in dogs. What suggestions do you have for treating mange? What are the symptoms of these mange disease? And what is the cause of it? What care has to be taken to avoid it? Also, have you heard about the Tramadol tablets that are effective for pain relief?